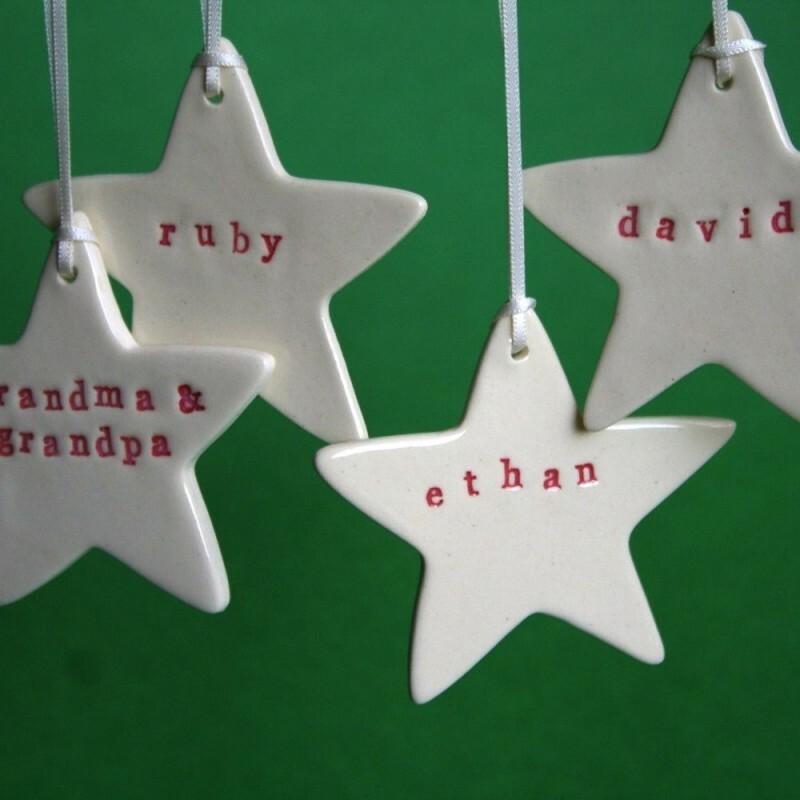 Kylie Johnson hand made ceramic star ornaments personalised with your names for a unique gift to be treasured year after year. Please note: Personalised stars need to be placed on a separate online order with only the stars. Place order by 24 September for early November delivery. Final orders to be placed by 8 November for December delivery. 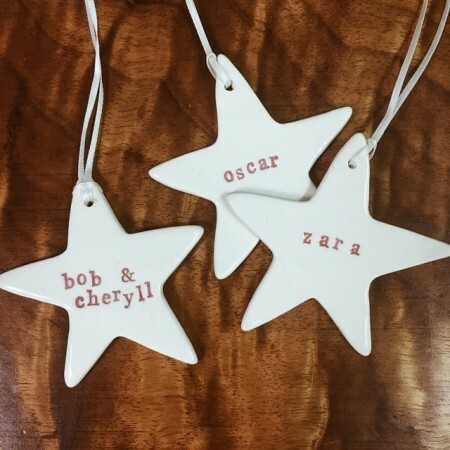 Delicate handmade Christmas ceramic star ornaments personalised with the names of your choice by talented poet and artist Kylie Johnson. A unique gift for colleagues, children and loved ones of all ages. Choose two words plus an & sign, one name and a year, or simply one name. Please note: Personalised stars need to be placed on a separate online order with only the stars. All star orders will have our standard postage charge and free shipping does not apply. You can also choose to pickup from any of our Brisbane store locations and can select this delivery option at checkout. Buy quality to last a generation, not quantity that ends up in landfill. Made in Brisbane, reducing green house gas emissions from overseas imports. 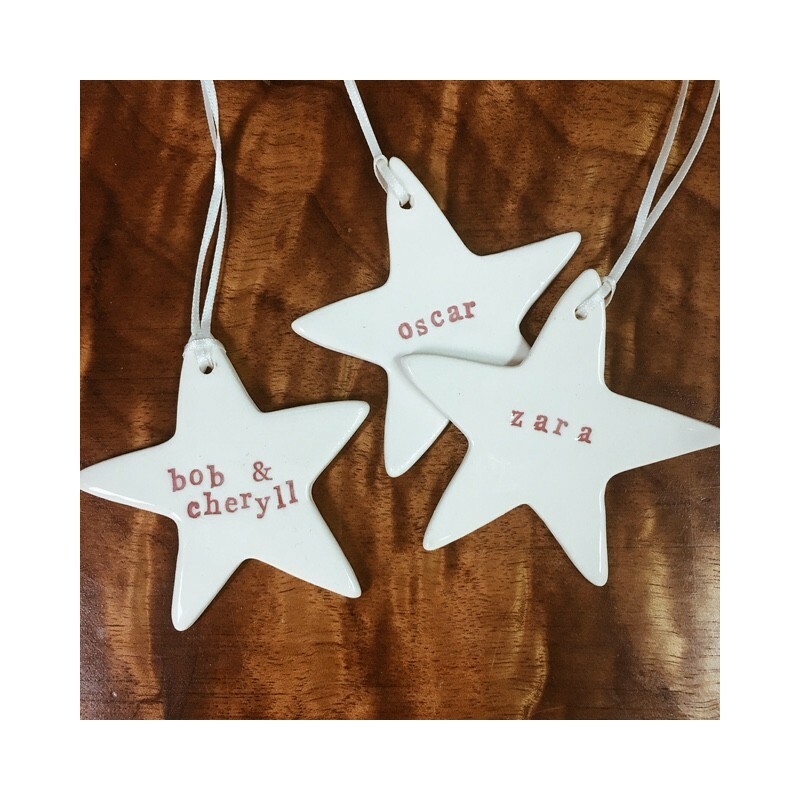 Please note: each lower case letter or number is hand stamped and this creates a quirky organic name, they are not created by a machine, so there is an element of play in the final result. 1. Choose whether you would like to have these delivered right to your door or you would like to collect from our Paddington or City store. 2. Add to cart the number of stars you wish to order. 3. In the Message Box at Checkout, enter names. Note there is limited space so stars are only available with:- single names - two first names separated by & - two words like: johnson family- single name and year. 4. Enter name(s) for each star on a new line check spelling. See the rest of our Kylie Johnson ceramics. I bought one for every member of my family and they loved them and looked gorgeous on our first family tree together. Lovely xmas decorations, I've had these made for my kids, dogs, nieces and nephews. Their uniqueness is great, very well made.